The all-new Volvo XC60 might not be the best car in its class, but it offers rewards its competitors can’t match. After nearly ten years, the Volvo XC60 finally gets an update for 2018. And what an update it is: Volvo’s best-selling vehicle is now built on an all-new platform, has a totally different look and feel, and offers an optional plug-in hybrid drivetrain. 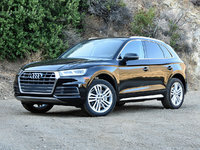 While the new XC60 is second to none among luxury crossovers when it comes to style, safety, and technology, that’s still not enough to beat the popular Audi Q5 and BMW X3, which have also been updated for 2018. 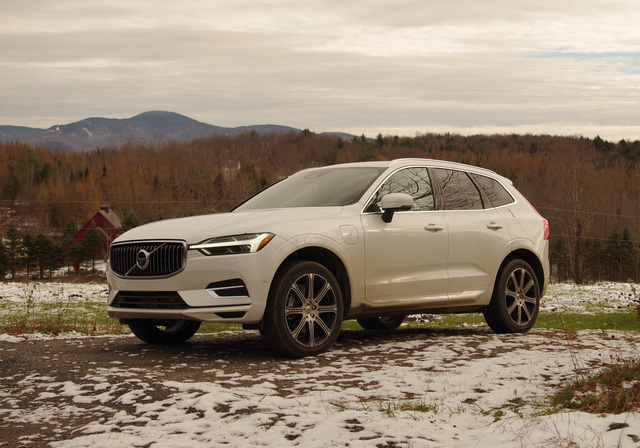 The Volvo’s semi-autonomous driving mode, Scandinavian styling cues, and amazing sound system are truly incredible—but they can’t make up for confusing menus, a high price tag, and lackluster hybrid performance. That means the new XC60 likely won’t attract BMW, Audi, Lexus, and Mercedes buyers—but it will certainly satisfy anyone who wants something a bit out of the ordinary. The 2018 XC60 has actually been in the works since 2010, when Chinese automaker Geely purchased Volvo and decided to invest $11 billion in what it called a Scalable Product Architecture (SPA). The SPA includes the parts, designs, and engines that all new Volvos share, starting with the three-row XC90 crossover. From the front, the five-passenger XC60 is basically a smaller version of the XC90, a car Nicole Wakelin praised in her review for CarGurus. From the side, it looks like the outgoing XC60, with a few pleats in the sheetmetal added for character. And from the rear, it’s a dead ringer for the V90 wagon. Inside, the XC60 is unmistakably Scandinavian, with clean lines, matte finishes, and minimal fuss. Volvo makes one of the best car interiors you can buy at any price—although a shifter made by famed Swedish glassmaker Orrefors and tiny Swedish flags feel a bit gimmicky. The same goes for headlamps designed in the shape of Thor’s hammer, from Norse mythology. Every 2018 XC60 comes with standard all-wheel drive (a front-wheel drive version is in the works), an 8-speed automatic transmission, and a 2.0-liter, 4-cylinder, turbocharged engine. 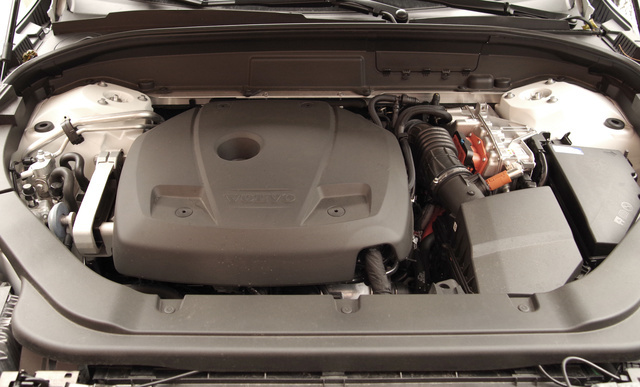 If you order an XC60 T5, that engine is good for 250 hp and 258 lb-ft of torque. The T6 adds a supercharger that works in tandem with the turbo to steadily deliver up to 316 hp and 295 lb-ft of torque without a hint of turbo lag. We tested the T8, which is a plug-in hybrid. In addition to its turbocharged, supercharged 4-cylinder gas engine, an 87-hp electric motor can drive the rear wheels. Combined, the powertrain is capable of 400 hp—the same as a base Porsche Macan Turbo—and a whopping 472 lb-ft of torque. If you charge the T8, you can get up to 17 miles of electric-only driving. Fuel economy is supposed to be a combined 26 mpg—less than the 31 combined claimed by the Lexus NX 300h. Unfortunately, when I didn’t plug in the Volvo, I averaged city mileage in only the low teens—and my combined mileage was around 22 mpg. Similarly, driving the T8 was a mix of highs and lows. It was best on highways and back roads, where it felt well-balanced in curves and smooth on straightaways. Steering feel was light but responsive—and the turbocharger, supercharger, and electric motors effortlessly engaged in the background whenever necessary. 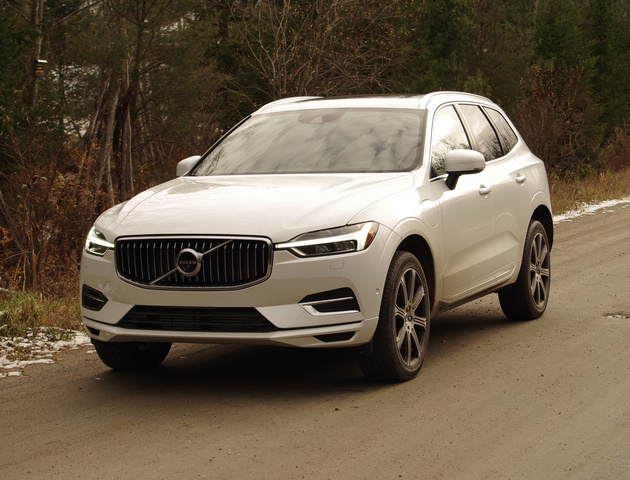 On gravel roads with patches of ice and snow, the all-wheel drive (AWD) system always kept the XC60 headed in the right direction—but occasionally allowed a momentary loss of grip before taking over. And in city traffic, the XC60 felt a little out of balance. Much of that was due to the T8’s surprisingly grippy regenerative brakes, which proved almost impossible to modulate. 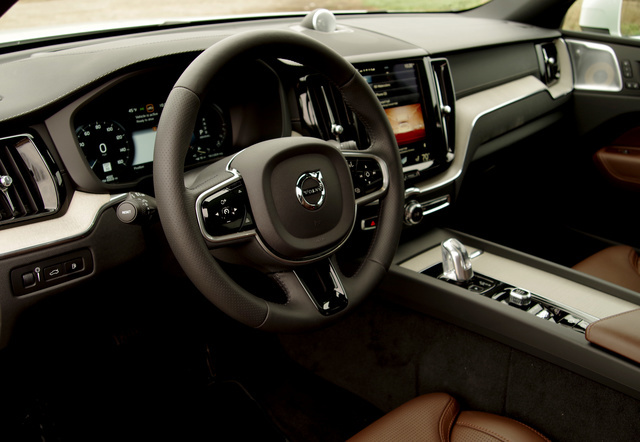 The new Volvo comes in three trims: The base Momentum is well equipped, the sporty R-Design has more aggressive design elements, and the Inscription has luxurious touches like stitched leather trim and driftwood accents. 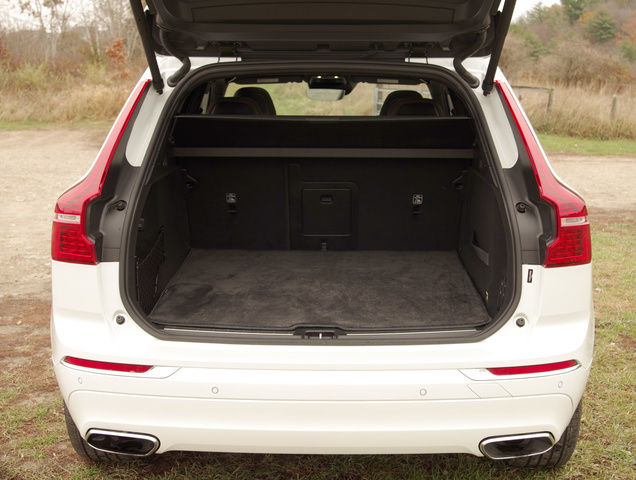 With the rear seats folded, the 2018 XC60 offers 63.3 cubic feet of cargo space—about 4 cubic feet less space than the outgoing model. Still, both headroom and legroom are improved from last year’s XC60. Every XC60 comes standard with a 9-inch Sensus touchscreen, which controls everything from seat heaters and audio processing to how heavy the steering feels and how long the lights stay on after you lock the car. 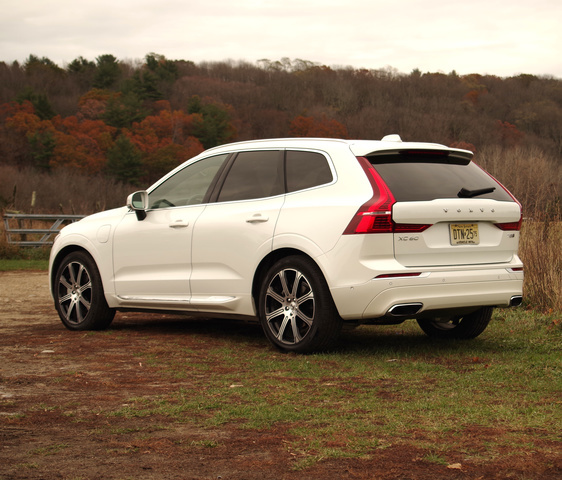 Overall, the XC60 is one of the most customizable cars you can buy. For instance, the optional massaging seats have over 30 options, you can adjust whether the heated seats turn on automatically when you start the car, and you can set the interior lighting to change color depending on the temperature. Unfortunately, lots of options mean lots of menus. 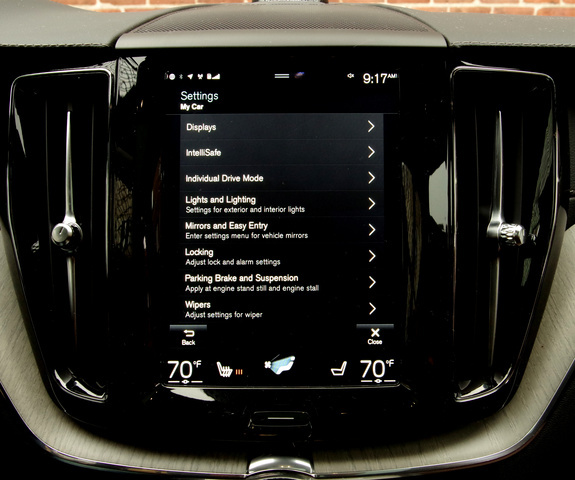 Some of those menus are hidden on the left of the touchscreen, some pull down from the top, and others pop up only after you push a button elsewhere in the car. Additionally, there’s a whole row of in-car apps—but because Android Auto and Apple CarPlay come standard, most of those apps are redundant. Like a smartphone, Sensus lets you swipe between screens—but that’s hard to do while driving. Even performing a simple task—like resurfacing the radio controls after they’ve been superseded by another menu—can take your eyes off the road for a long time. One bright spot is how good the XC60 sounds. If you’re willing to spend $3,200, you’ll get one of the best in-car sound systems you can buy—a 15-speaker setup from Bowers & Wilkins. It even comes with an audio setting that mimics the acoustics of the concert hall in Gothenburg, Sweden, and it’s worth test driving the car just so you can hear your favorite song on the sound system. Volvo has a reputation for safety, and the XC60 gets top ratings—including an Insurance Institute for Highway Safety (IIHS) Top Safety Pick +. Every XC60 comes standard with Volvo’s City Safety package. At low speeds, it can either stop the car or steer it away from potential collisions with pedestrians, bikes, and other cars. At higher speeds, it engages the brakes to help lessen the impact of a crash. New for 2018 is Oncoming Lane Mitigation, which can steer you back on track if you drift out of your lane and into the path of an oncoming vehicle. Blind-spot detection and lane-keep assist will even steer you back into your lane if you’re at risk of hitting a car or motorcycle that’s in your blind spot. However, those features are optional and must be ordered as part of an $1,110 Vision package. All these active safety features are designed to work as a last resort, and take over only if they don’t sense adequate steering and brake input from the driver. 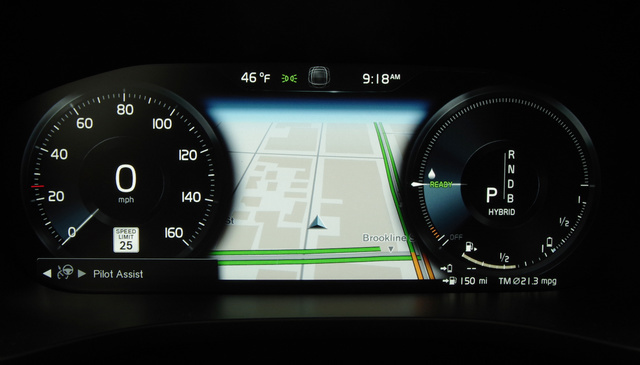 Pilot Assist II is Volvo’s updated automatic cruise control system, which can steer the car, keep it between lane lines, and adjust speed to match traffic. It now works at speeds up to 80 mph and no longer requires a car in front to follow. While the XC60 definitely isn’t a self-driving car—it requires you to keep your hands on the wheel, and it has trouble detecting faded lane lines and cars that cut you off in traffic—it worked very well every time I tried it, on busy city streets as well as open mountain roads. In base Momentum trim, the XC60 starts at $41,500. While that’s more than a base Acura RDX, Audi Q5, or BMW X3, only the Volvo comes with a standard panoramic sunroof, plenty of active safety features, 18-inch wheels, and a 10-way power driver’s seat at that price. The R-Design starts at $44,800 and adds more technology, plus more aggressive design and 19-inch wheels. The top-of-the-line Inscription, which we tested, starts at $45,300. It comes with unique stitched leather trim, interior chrome accents, and optional driftwood inlays. Start adding options, however, and the price can skyrocket. With 22-inch wheels, Nappa leather seats, and a refrigerated glove compartment, you can push the MSRP of a T8 Inscription north of $70,000. I’m partial to the T6 Momentum with the Convenience Package. Its supercharged engine has plenty of power and gets combined fuel economy around 23 mpg, and options include Pilot Assist, an air suspension, keyless entry, power fold-down rear seats, and a hands-free tailgate that opens when you wave your foot underneath it. Altogether, it retails for around $48,100. Most people spending that much on a luxury crossover will probably choose a Q5 or an X3, but the Volvo remains a great value. After all, you’re not going to find another car in its class with the safety, technology, and style of the new XC60. What's your take on the 2018 Volvo XC60? GuruVV1MX Very bad experience. City safety is not functioning as Volvo promised. Michele Absolute best car ever owned. I have numerous Volvos, but the R-design is amazing. My entire family was in a terrible car accident 6 months after buying, totaled the XC60, and all walked away without even a dr. Visit. You cant put a price on that. Users ranked 2018 Volvo XC60 against other cars which they drove/owned. Each ranking was based on 9 categories. Here is the summary of top rankings. Have you driven a 2018 Volvo XC60? CarGurus has 11,523 nationwide XC60 listings starting at $4,000.